Gotham‘s currently running season 5 is confirmed to be its last, and recent episodes have demonstrated Bruce’s keen ability in hand-to-hand combat and his intelligence regularly outpaces that of the adults in the room. It’s time for the build-up to pay off and for Bruce to finally emerge as the Caped Crusader. Previous announcements have confirmed that at least part of Gotham‘s final episode will take the form of a flashforward, in which comic-accurate versions of the show’s cast will be seen. Penguin will be fat, Jim Gordon will have a mustache and Bruce Wayne will be Batman. However, it has also been revealed that the final version of the iconic superhero of Batman won’t be entirely played by David Mazouz. In anticipation of that long-awaited final episode, Fox’s official Twitter account has released a brand new poster showing the familiar rear profile of the show’s Batman – pointy ears and all. 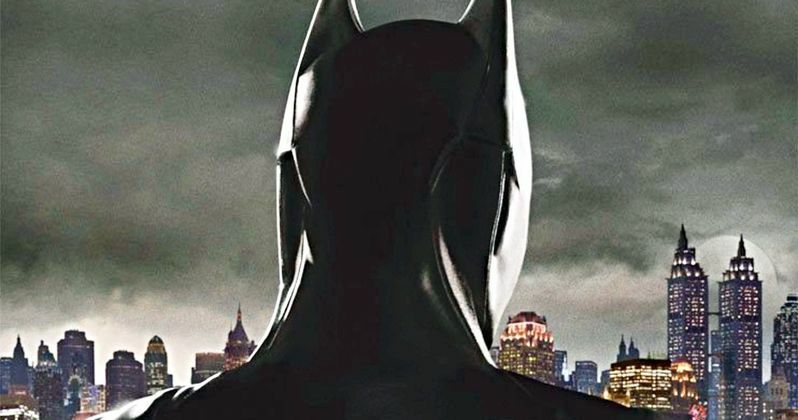 Featuring the tagline “The Dark Knight is upon us,” the poster showcases a little of Mazouz’s Batsuit, as his now grown-up superhero surveys Gotham City from above. Gotham‘s showrunner previously revealed that their Batsuit design would, like the current season as a whole, be heavily influenced by Christopher Nolan’s The Dark Knight Rises. Certainly, there’s elements of Christian Bale’s final costume in this image, in particular the cowl, but it could also be said that this design is more of a classic take, with some Tim Burton-era influence thrown in.